Many years ago when I was still an amateur turner, I saw a demonstration at my club by an experienced professional. He was talking about finishing a piece. "If you're selling your work," he said, "there are five things the buyer takes into account. The first is the shape, the second the finish, the third the finish, the fourth the finish and the fifth the price." Whether or not this is completely true, I do not know, but I am sure there is some truth in it. Wood is a tactile medium. It needs to be touched and, if the piece is meant to have a smooth finish, the smoother and silkier the better in my view. I am not talking here about textured, scorched or otherwise enhanced finishes, but merely a smooth finish one would normally gain from sanding down through the grits and applying oil or lacquer. 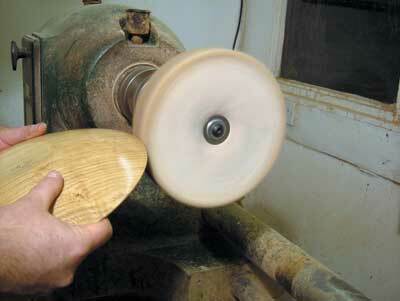 Buffing the piece after oiling is a great way of achieving this type of end result. This article takes the reader through the complete buffing process to achieve a perfect finish every time. I have assumed that the piece has been sanded, finishing with your choice of grit. I usually sand down to 1500grit and, of course, the finer you go, the silkier the finish. I then normally apply at least two coats of Danish or finishing oil. If you are going to buff an oil finish, it is vital that the oil has had time to dry completely. Leave the piece to dry at least overnight. Buffing is a three-part process and I recommend that you do not miss out any part. You will need three mops like those in photo 1. These are 8in loose-leaf mops. 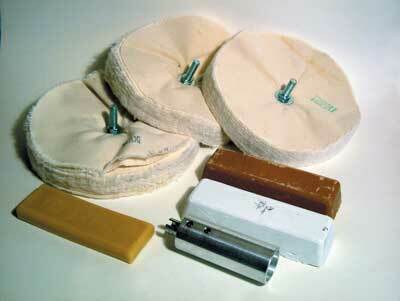 The first is made from linen, the second is a linen and cotton mix and the third is made from flannel. The mops will be used with three different compounds. 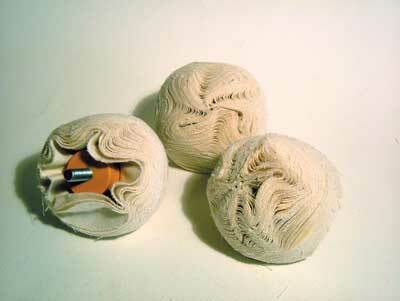 I use Tripoli, white diamond and carnauba wax on the all-linen, cotton/linen mix and all-flannel mops respectively. The mops are labelled and it is wise to avoid mixing them up. 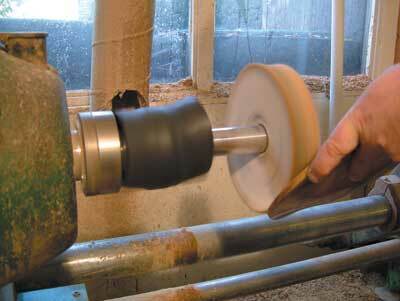 You will also need a way of holding the mop onto the lathe or motor spindle. A pigtail is a common method and this can be held in a Jacob's-type chuck held by a Morse taper in the headstock. The method I use to hold the mops is an aluminium adaptor shaft with a female screw thread on one end. A bolt through the mop with a corresponding thread does the rest. An advantage of this method is that the mop rotates further away from the chuck, providing more clearance for the piece when buffing. Even with this method I have found it advantageous to cover the chuck with a section of motorbike inner tube. This will not prevent marking the piece if it accidentally comes into contact with the chuck, but damage is reduced considerably - photo 3. When the buffing wheels are new, you can expect them to throw loose fibres of lint until they are fully loaded with compound. 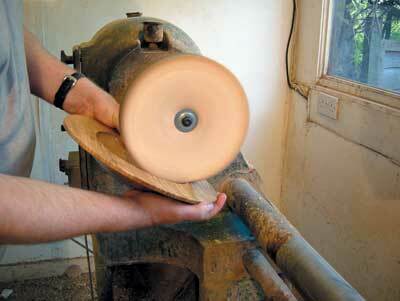 You can minimise this shedding if you prepare the wheel first. 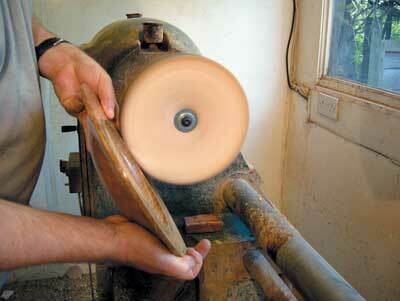 Wrap a piece of coarse abrasive paper around a piece of scrap wood and press it against the spinning mop - photo 4. With your free hand hold your extractor outlet close to the wheel to collect loose threads. This method can also be used to clean the mops if they become overloaded with compound or wax. I recommend using suitable eye protection and a dust mask or respirator. Tripoli may cause irritation to the eyes, nose and respiratory tract. Stage one of the three-part process is to use the Tripoli. Set the lathe speed to between 1200 and 1700rpm - at the higher speeds the buffing mops will behave 'harder' and work more quickly. Working at slower speeds will make the mops seem softer and enable you to get into finer details. Load a generous amount of Tripoli compound onto the mop, holding the compound at in the lower quadrant of the mop. If the mop were a clock face, the compound should be loaded between six o'clock and half-past eight, if the lathe is rotating towards you in the normal way - photo 5. 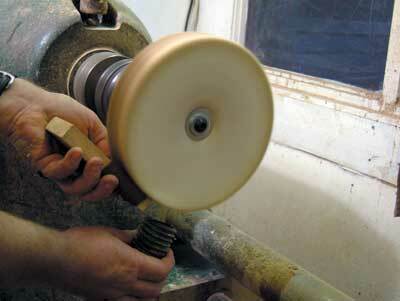 Then, holding the workpiece in the same lower quadrant, begin buffing - photo 6. 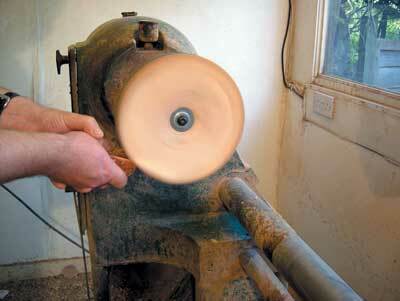 Apply enough pressure to the wheel to distort is slightly. The Tripoli is a mild abrasive and will remove any minor blemishes there are in the oiled finish. There are a couple of things to look out for from a safety point of view. The first is not to allow the top edge of the workpiece to touch the mop. 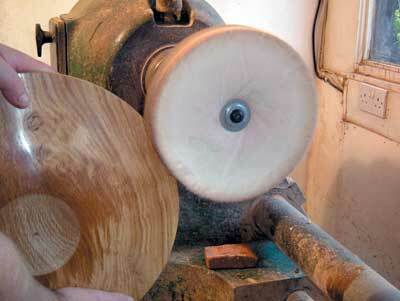 The second involves bowls that are undercut. In these cases it is important not to allow the undercut rim to touch the mop at about six o'clock - photos 7 and 8. Both these situations will result in the mop grabbing the workpiece from your hands, causing possible injury to you and damage to the piece itself. 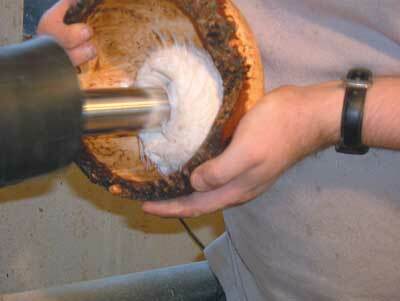 Photo 9 shows a safer way to buff the rim of an undercut bowl. Buff the bowl in a methodical manner; I find it useful to pick a distinguishing mark, perhaps a knot or wild grain to start buffing. 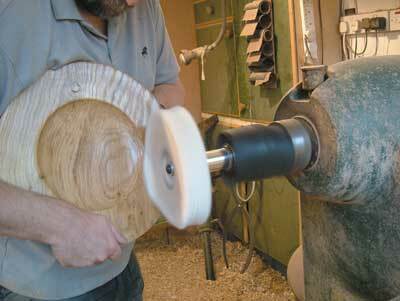 Work all the way round the bowl until you return to your chosen mark. This way you will know that the whole piece has been worked on. Remember to buff the edge of your bowl - photo 10. The second stage is to repeat the process with the second mop using white diamond. This is also a mild abrasive, but its main purpose is to clean the Tripoli from the work piece. Again, a generous amount of compound needs to be used and pressure applied to the wheel sufficient enough to distort it slightly. The third and final stage is to use the third mop loaded with carnauba wax. This time apply only enough wax to coat the mop lightly, but keep loading the mop. Little and often is the key here - photo 11. Once all three parts have been carried out, your piece will feel silky smooth. The pictures cannot show this but I can assure you that you will feel the difference. If you prefer slightly less shine to your work, it can be knocked back by very lightly rubbing over the piece with ultra fine wire wool of Webrax-type cloth. If you are unhappy with the finish you achieve on your work, give buffing a try. Do remember though that buffing will remove minor blemishes from the finish but will do nothing to hide tearout from the tool or badly sanded work. Buffing mops come in all shapes and sizes. 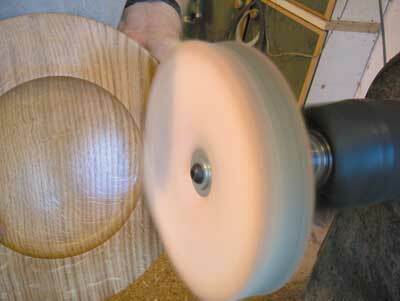 Photo 2 shows three bowl mops for accessing the insides of bowls and photo 12 illustrates one of them in use, polishing a natural-edge burr chestnut bowl. "Wood is a tactile medium. It needs to be touched and if the piece is meant to have a smooth finish, the smoother and silkier the better"